A single player game relying on speed of reactions and mouse skill, much as basketball keepie-up, but from a different perspective : Ping Pong. 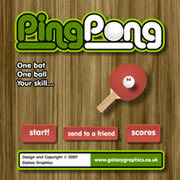 Much like the basketball game, Pingpong offers several branding opportunites on the title screen and the main game area. You can currently see the Galaxy Graphics logo watermarked into the play area; the same area the player spends all their playtime looking at. This could be your logo (or your clients) instead. The pingpong bat and pingpong ball are also suggested as good areas for further branding. Like many of the other games produced by Galaxy Graphics, the Pingpong game includes a hi-score table. This is a great device for ensuring players return again and again, checking if they are still at the top of the table. Providing your website hosting supports databases such as MySQL, then adding a hi-score table into your game is relatively easy. Galaxy Graphics will provide you with a PDF document showing how the hi-score table system works and how you can integrate it into your website, with code examples.